June 25, 2015 (Borrego Springs) -- You just never know what you might see on a warm desert night out in Borrego Springs! This shot by our editor, Miriam Raftery, was taken on the summer solstice eve. 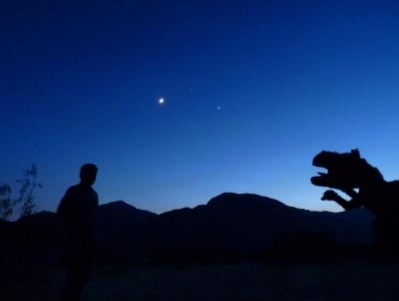 The figure at left, a photography student on Dennis Mammana's night sky photography tour, is facing off with a sculpture of a giant sloth (a creature that once roamed the Anza-Borrego Desert). The gigantic metal sculpture is one of many created by artist Richard Breceda that appear tto rise from the desert floor, captivating the imaginations of young and old alike. The moon, Venus, and Jupiter are faintly visible in the sky above.